DESCRIPTION Active Life Nutrient Capsules are a balanced vitamin/mineral/ trace element supplement with over 22 essential nutritional ingredients in a convenient once daily capsule. 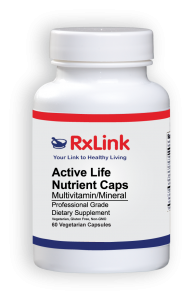 DESCRIPTION RxLink Active Life Nutrient Capsules are a balanced vitamin/mineral/ trace element supplement with over 22 essential nutritional ingredients in a convenient once daily capsule. FUNCTIONS Studies have shown that a high percentage of adults and children in North America and other developed countries eat less than the minimum daily allowance of 10 or more essential nutrients. Adequate amounts and proper balances of these nutrients are needed not only for maintaining good health, but also for the dietary management and prevention of chronic disease. RxLink Active Life Nutrient Capsules have been formulated to provide nutrients in their active forms including: methylcobalamin, the active form of vitamin B12; MTHF, the active form of folic acid; and P5P, the active form of vitamin B6. This is in addition to active antioxidants such as alpha lipoic acid, lutein, lycopene and zeaxanthin. Active Life Nutrient Capsules provide vital nutrients for the support of: • Bone health by providing adequate dietary intake of all of the B Vitamins along with vitamin D, boron and zinc. • Cardiovascular health by providing CoEnzyme Q10, lycopene, lutein, zeaxanthin, vitamins A, C, E mixed carotenoids and a complete B vitamin complex. • Metabolic functions such as proper blood glucose levels which are supported by vitamins C, E, B6, B12, niacin and biotin as well as chromium, alpha lipoic acid and manganese. • Anti-aging with the inclusion of vitamin A, C, E, mixed carotenoids, lutein, alpha lipoic acid, lycopene and zeaxanthin. • Fat metabolism with the addition of choline and inositol which support fat metabolism and myelin sheath health. 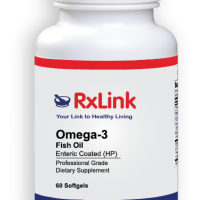 Citrus and gluten free, RxLink Active Life Nutrient Capsules provides a balanced multiple vitamin/mineral supplement in a convenient capsule form. INDICATIONS RxLink Active Life Nutrient Capsules is a useful dietary supplement for individuals who wish to consume essential nutrients for health. Other ingredients: Vegetable cellulose (capsule), microcrystalline cellulose, vegetarian leucine. Contains: Fish (Tilapia). This product contains NO citrus, gluten, or yeast SUGGESTED USE Take 1 capsule daily with food, or as directed by a healthcare practitioner. SIDE EFFECTS Warning: If pregnant or nursing, consult your healthcare practitioner before taking this product.